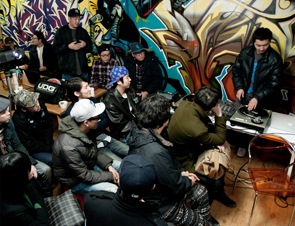 The Indie Space AGIT is now widely recognized as the core and the base space of youth culture in Busan. People often say that they get the sense of ’’real life’’ whenever they visit the AGIT and meet people there. Since last year’’s summer to the late autumn, for about 100 days, the area in front of Busan National University which is the representative cultural space for youths in Busan was once again filled with life. (Busan is a port city located in the south eastern part of Korea and it is recently raising its reputation as the center for culture and art tourism with such events as the Busan International Film Festival.) This is because a public art project for youth ’’Rejuvenation’’ supported by Busan Cultural Foundation was held there, which was planned to raise the public awareness of youth culture of Busan that has been diminishing since the 2000s and to create a sustainable ecosystem. For 100 days non-stop, diverse and fresh cultural planning was played out in multiple locations around the Busan National University and as a result, this project was not only successful beyond expectations, but also received a lot of attention from other regions. The group that planned this project is the ’’Funny Revenge’’. The area of Busan National University was the place that produced youth culture and it flourished not only in Busan but throughout the country during the democratic movement and when the folk culture was booming in the 80s. It was also the place where diverse independent culture and non-mainstream culture was energetically intermixing during the early to mid 90s. But in the late 90s, the young cultural artists such as indie bands and artists who were active in this region began to move out to Seoul which was the center for heated discussions of independent culture during those times, and the youth culture of Busan and the area around Busan National University rapidly lost its vitality. Funny Revenge is the organization that was formed during those times. Funny Revenge is a cultural planning organization with unique history. The name Funny Revenge originated from the passage in Murakami Ryu’’s novel 『69』which reads, "The only revenge for the mundane world is to live a fun life." This organization has been encompassing not only the Busan area, but also Japan, Hong Kong, China, and Northeast Asia by literally making non-stop cultural planning in various areas for the last 10 years. It now has grown into a representative cultural planning organization that is recognized nationwide in the area of independent culture. 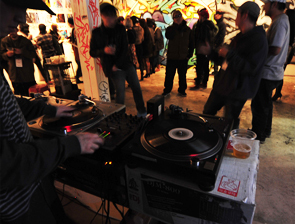 It also actively introduced diverse street arts such as B-boying and graffiti art to the community as well as traditional genres of art, dance, and music. The organization was also very active in its role as the leader and presenter of seminars, forums, and discussions. However, they had to endure very poor conditions as they create plans of such magnitude. Problem of space was the most desperate in need and for 6 years after the foundation of the Funny Revenge, they had to use the office that was illegally occupied at the Busan National University. They had to be cautious and because it was difficult to act freely in the space, they usually planned outdoor events. Then, in the spring of 2010, they were finally able to have a space of their own with the help of colleagues and seniors in the area who cherished the commitment and values of the Funny Revenge. That very place is the AGIT, which is currently playing the key role in the youth culture in Busan. The AGIT See related article from theApro is near Busan National University. A day care center was renovated together with several artists in the region and the space was able to be opened. The AGIT is a two-storey building with a small outdoor children’’s pool and a perfect party-size yard, and it is being freely visited by outside cultural organizations and artists because many artists in the region helped to build the space from the beginning. The space that is opened to everyone can be used as one’’s own for anyone who is participating in the project that involves the AGIT. The first floor is equipped with an office, a recording studio, and two rooms where residency artists and guests from other regions can stay. There is also a band rehearsal studio in the basement. The gallery on the second floor has the space for various exhibitions, seminars, and workshops, along with work space for 5 to 6 residency artists. The residency artists from abroad and other cities often participate in AGIT’’s cultural planning between their works and get the chance to interact with the members of youth culture in the Busan region. Especially during the small and casual front yard parties, artists and young people with new faces really comfortably enjoy the food and drinks and interact with people. This kind of personal exchange and network are also few of the most important values of the AGIT. Centering around the former artist and Director Soung Hyo RYU, the space is being managed by the current Representative who is a graffiti artist and others such as popping dancers and artists from various genres. Recently, they have recognized the importance of communication and networks, and they are planning numerous projects in relation to such topics. Starting from the staffs, they are not tied down by general titles such as the Representative among others, but work in a free and lateral relationship. Externally, they are planning many international events and participatory community events. See related article from theApro They are also actively involved in various local and national social issues. They are not only connecting and networking with non-organizational culture, but also organizations from various fields and expanding the boundaries of cultural arts. The Art Director of AGIT, Soung Hyo RYU, who has actually led the Funny Revenge since the early days and who has actively served as the General Director of the ’’Rejuvenation Project’’ last year had actually published a book called 『Funny Revenge to the boring world』 last summer, which is about the past 9 years of activities and experiences of the Funny Revenge and the AGIT. The book tells the story of their beginnings with documented pictures and as you read the book, you often get excited and feel your body heat up, but also the record has many points that make you calmly consider the two key words ’’region’’ and ’’youth culture’’. The book contains the chaotic times of the Funny Revenge’’s beginnings, all sorts of minor episodes, and candid stories of success and failure. Nine years later, they are still in a poor situation, but I can’’t help being amazed and respectful as I see them constantly making and planning progressive projects. The Funny Revenge that is managing the AGIT is a non-profit organization. So, there isn’’t a significant source of income for the organization. This is why just the bare management of the space is always tight and especially as the contract for the space is expiring next year, continuous operation of the AGIT is yet unclear. 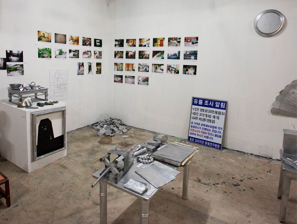 However, the AGIT has now become the core space and base of Busan’’s youth culture that is recognized by everyone. People often say that they get the sense of ’’real life’’ whenever they visit the AGIT and meet people there. The AGIT is always invoking sharp and fresh stimulation for the youth today who are constantly intimidated, for today’’s Korean society that labels all areas other than Seoul as second tiers, and the current face of culture that is rampant with abstract discussions and becoming more academic than the world of academia itself. In this boxed in and mundane society where everything is represented in numbers and ranks, and ultimately becomes exhaustively boring, they are shouting to the world that meekly following such order of the world is not ’’real life’’. And they finally created the space by dreaming ’’a fun revenge for the mundane world’’. This is why the AGIT overflows with the sense of the unique and the extraordinary. 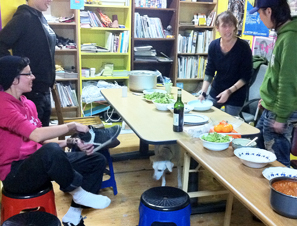 Amidst the face of Busan culture where everyone thought one has to go away to Seoul and abroad to be successful, they have stayed in the region with simpleminded honesty, almost playfully, and has been contemplating what ’’real culture’’ is and further more what cultural arts can do to better the society. I sincerely hope and continue to cheer for them that they will be able to not work towards fame and money, but continue their fresh story and contemplations as they freely create controversy, battle each other, laugh and stir up noise as they have been. Jang, Hyun-Jung has once been active as the vocalist of one of the first generation indie rock band called 'Ann'. With his thesis on the indie bands in Busan region, he got his Master’s and Ph.D. in sociology. He wrote several books and is currently active as the Co-representative of the Busan Noridan, Chief Editor of the magazine [Hello Gwanganlli], and Representative of Homilbat publishing Co., among others.